Meet the Superwoman Behind Rose & Rex, Our Official Toy Partner for 2017! Last fall, we worked with stylish toy boutique Rose & Rex for our Fashion Mamas Fitness launch party. We knew the brand was special when they rolled into our event with a magical trunk filled with heirloom-quality toys that our kids truly loved. The fun continued when we invited Rose & Rex to participate in our first-ever Kids Fashion Fair pop-up shop (they created the most gorgeous play area!) and we also joined their holiday event with The Little Market that same week. A romance was clearly budding. Our members were equally charmed by the company's founder Allie Klein, a native New Yorker with beauty and brains (she has a a dual M.S.ED degree in Early Childhood and Childhood Education and is a play-based tutor, no big deal), and a true passion for elevating the playtime experience. We're ready to take this Fashion Mamas x Rose & Rex friendship to the next level, so we're excited to announced that Rose & Rex will be our official toy partner for 2017! 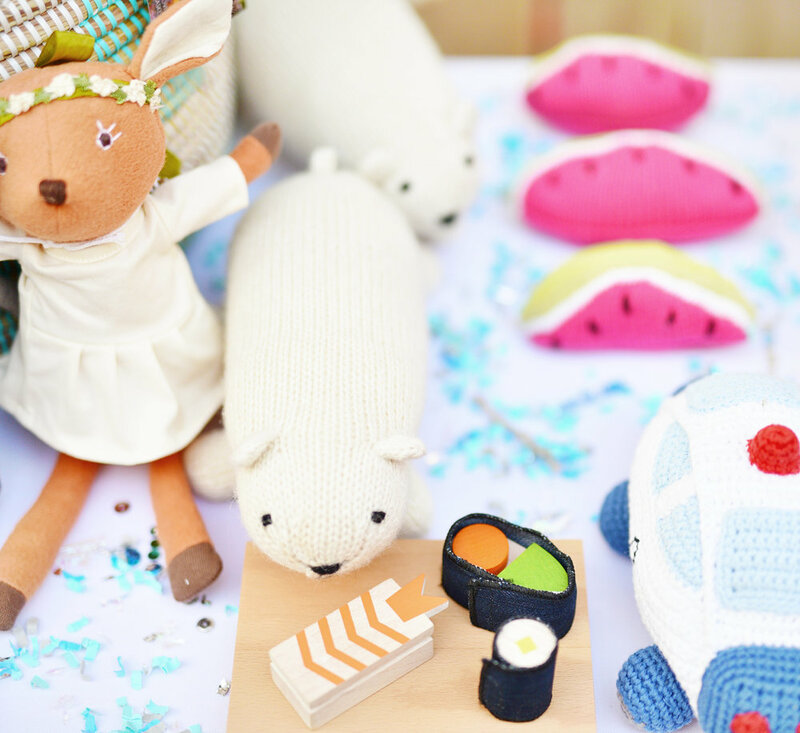 In addition to participating in our Kids Fashion Fair shows across LA, SF, and NY, their high-quality, conscious toys will be incorporated into tons of our members-only events throughout the year. Read on to learn more about Allie and her inspiring company. Rose & Rex is in a league of its own. Can you share the story behind your brand and its name? The inspiration for the name Rose & Rex came from two of my first students, Rose and Rex, who taught me what it means to learn through play and inspired me to forever see the value of imagination. The brand was born out of a desire to start a larger conversation about our culture’s approach to learning. Many people view play and learning as opposite concepts, rather than deeply connected complements. In reality, play is the single most important tool young children have to develop their social, emotional, physical and cognitive skills. Inspired by students like Rose and Rex, I wanted to create a brand that promotes skill building and learning through imaginative play with high quality, eco-focused and beautifully designed toys. We aim to be an accessible, imaginative and refreshing resource for all things play-based learning, including toys and content. One of my goals in building the Rose & Rex brand is to create a company that’s challenging the assumption that learning is best achieved by completing worksheets at a desk. What were your favorite types of toys growing up? This is a toughie because there were so many that I loved! I’d have to say my two favorite types of toys were blocks and dolls. I had this really old school wooden block set that came with miniature horses that I played with for years! I also loved dolls. I would spend hours creating clothes for them, building them homes and “cooking” for them. My all-time favorite toy though was a stuffed animal dog that I (creatively) named Puppy and still have today! What do you look for in a toy before inviting them into your uniquely curated online shop? I work with a group of teachers and child development experts to evaluate every toy that we invite into the shop. The first thing we consider is whether or not a toy is imaginative and open-ended, as we feel that open-ended toys promote the most robust skill building. To us, open-ended means any material or object that can be transformed, that comes to life in a child’s hands and that does not have a single, specific purpose or goal (i.e., press this button and a song will play). Next, we look for toys that are carefully crafted and healthy! We find toys that are high-quality, non-plastic and made out of toxin-free materials. We are always environmentally conscious! Last, we only sell toys that are stylish. Design is very important to us and we take pride in finding educational toys that parents will actually enjoy seeing scattered on the living room floor. We love that your toys have an educational purpose as well. What would you say is the very best type of toy to incorporate into a little one’s life early on? The best type of toy is open-ended and imaginative. From building blocks to cardboard to natural materials to plush dolls, the best things for children to play with are any materials or items that can be personalized and manipulated by a child’s imagination. Since it’s so hard for me to narrow it down to one best toy, my ideal toy chest would include: a set of building blocks for cognitive development, a transportation toy for gross motor support, a few pretend friends (animals or dolls) for emotional and social learning, eco-friendly art materials to nurture creative expression, and a set of “manipulatives” for learning math concepts and inspiring pretend play. What would you say has been your brand’s “claim to fame” moment? Well, now our claim to fame is being the official toy partner for Fashion Mamas! Otherwise I’d say our brand’s claim to fame from a mission perspective is that we sell skill-building toys that are imaginative, stylish and never plastic! It’s also always cool when we get a new piece of press, like having toys featured in Architectural Digest. One other fun claim to fame moment was partnering with Fashion Mamas and The Little Market for a give back holiday play event at Au Fudge in Los Angeles. I am a life-long New Yorker, so starting to establish the brand in LA with such great women who support both our play mission and our give back mission was really exciting! What is your bestselling toy of all time? Our Fairy House Kit, which makes me happy because the world needs children who believe in magic, especially these days! Tell us more about your charity party, Second Chance Toys. When I started Rose & Rex I knew I wanted the brand to give back. Every child should have the right to play in a healthy world, so I created "Play It Forward," our social initiative. Thanks to each individual purchase at Rose & Rex, we are thrilled to sponsor Second Chance Toys. SCT is a nonprofit that rescues, refurbishes, and donates plastic toys to children in need. By collecting toys made out of non-biodegradable plastic that would typically end up in landfills, SCT helps protect the planet and promote children’s ability to play. In addition to monetary donations I also work with Second Chance Toys as a content contributor and organize toy drives at Rose & Rex events. What inspired you to work with Fashion Mamas? I could go on and on about all of the reasons why I love Fashion Mamas and have wanted to work with the FM community. In short, I believe that children and their mamas can and will change this world and I want to collaborate with a group of women who feel the same way. Fashion Mamas value creativity, innovation and kindness. They are authentic women who are raising authentic children. As I have done more and more fantastic events with FM, the entrepreneurial women I have met, the friends that I’ve made and the magical mamas I have seen with their children have inspired me. The special FM community that founder Natalie Alcala has brought together is the perfect play partner for Rose & Rex! We love your style, Allie! What are your favorite fashion brands and places to shop? Thank you! I love fashion and actually think that fashion and toy design share a lot of similarities. My favorite brands and places to shop at the moment are: Vince, Rag + Bone, Alice + Olivia, Helmut Lang, Equipment and Chanel (I’m a total sucker for all of their shoes!). Last but not least, do you have any exciting projects coming up? I have to say one of the things that we are most excited about is a year of fun events with Fashion Mamas, so stay tuned! We’re also excited to be planning a number of pop-ups around the country, which I love because it’s great to bring our toys to new places and meet our customers and new friends in person! The first is our online Toy Advisor, where parents can get complimentary advice and personal toy picks from a child development expert to help support their child’s individual developmental needs; the second is that we are now doing Rose & Rex birthday parties and events where we are creating custom play spaces, goody bags and one-of-a-kind birthday gifts, all of which is really fun because it is very special for us to be a part of a little one’s big day! Follow the Rose & Rex play journey on Instagram at @roseandrex and Facebook at Facebook.com/roseandrex.